An attractive, entry level board with some handy features at a fair price that beginners will especially love. Neat and portable. Broad range of staple sounds. Good onboard FX. DAW integration features. Not all of the sounds are useable. Sound editing is basic. Plastic body. 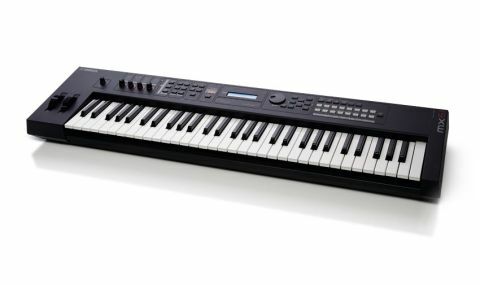 As the newest edition to Yamaha's synth series, the entry level MX range is priced to sell. We've already seen the MX61 going for as low as £499 at some retailers - great news for those wanting a wide range of Motif XS based sounds for a minimal outlay. At just 4.8kg's (10lbs), it's one of the most portable 61-note boards around and regular giggers will no doubt welcome this. Build quality isn't bad for the money but the case is plastic throughout, you'll probably want to grab a flightcase to protect your investment. The overall tightness of the switches and dials is certainly fine and the synth action keybed feels good for playing both synth and piano sounds. "The controllers are great for making real time changes when playing live or in the studio"
In terms of onboard controllers, there are the standard issue, hard plastic pitch bend and mod wheels, four multifunction knobs, a data dial and 47 buttons for selecting functionality. The four knobs not only access different functions according to the knob function button (including filter cutoff/ resonance, part volume, panning, envelopes and FX send levels), but are used for DAW functions when the MX61 is in DAW Remote mode. These controllers are great for making real time changes when playing live or in the studio. For visual feedback, there's an old school red on black number display illustrating the performance number (a performance is a 16-part multitimbral set-up) and a two-line blue backlit screen for displaying voice names and editing tasks. It's intuitive to use and super easy to set up 16 different sounds and flick through them with the left/ right cursor keys while performing without having to menu dive. There's also no audible cutoff when switching sounds (which really helps in live situations). To alter sounds in real time, reach for any of the four knobs and tweak the filter, envelopes or FX levels. The 16 category select buttons simplify choosing from the 1,106 voices and 61 drum kits onboard (plus 128 user writeable voices). Categories include piano, keyboard, organ, guitar, bass, strings, synth lead, synth comp, sound EFX, ethnic and more. Splitting and layering these sounds is simple: hit the layer button to layer parts one and two or hit 'split' to split part one to the left and two to the right. To change the split point, hold the split button and hit the key where you want the split to feature. "There are definitely sounds we recognise from the original Motif and the EX5 before it"
The MX61's 128-note polyphonic sound engine is based on the Motif XS' waveform/preset library, and there are definitely sounds we recognise from the original Motif and the EX5 before it. Many are a tad dated compared to Korg and Roland's current offerings, and there isn't much in the way of real time performance control or anything as powerful an FX section as on the Motif so the sounds aren't quite as vibrant. That said, the overall sound quality is good (except for the nasty distortion and stepping that occurs when using the filter at high resonance levels) and all of the sounds will fit quite nicely into a mix in any style of music from Electronic to Classical. There are some good acoustic pianos and electric pianos present, and some quality synth pads and synth basses/leads. There are also some surprisingly nice acoustic drum kits, ethnic instruments, percussion and sound FX. Sadly, there are also weaker sounds onboard. The tonewheel organs lack a sense of authenticity (though the rotary speaker effect isn't bad) and the clavinets sound dated. Yes there are some decent strings onboard but some have a really annoying vibrato sampled with them, making them less useable. The sound editing is basic too - there's no DAW synth editor and you can't change the filter type or edit the voices at element level. There are the usual filter and amp envelopes onboard, plus an LFO, panning, mono/poly modes and portamento present. Thankfully, the VCM effects are pretty good and liven things up. There's a Global Reverb Block and separate Chorus Block, along with a good range of quality insert effects (maximum of four inserts per performance) including delays, phasers, distortions and more. On top of this, there's a built in Midi-syncable arpeggiator that can be applied to up to two parts in a performance at once. The arpeggiator Midi info can be outputted to your DAW and there are 999 presets to choose from to suit all styles. Also, let's not forget the Rhythm Pattern mode that provides access to 208 patterns for you to jam over. Even though you can't record your own, you can playback WAV files (no MP3's) directly from a USB stick (and save settings). Plus, you can route an iPod or any other audio device through the auxiliary input (phono) for jamming. All things considered, the MX61 is a competent board with some handy features. It will particularly appeal to those shopping around for their first synth or those who want a no-nonsense 'board with a solid range of staple sounds/FX for gigging and for studio work. The portability is an absolute godsend, it's a good basic controller for studio/DAW tasks, and is perhaps a perfect 'board for schools to use during teaching due to its ease of use and simple computer integration. Remember, the MX61 is ultimately a preset playback machine with some basic synth editing onboard. It's therefore a great starter and introduction to the world of synthesis without forcing anyone in at the deep end. A great price and decent range prepare you for the fun (and complexities) to come.